Last updated 11/4/2009 by David Giblin. Publication: Syst. Bot. 15: 67. 1990. 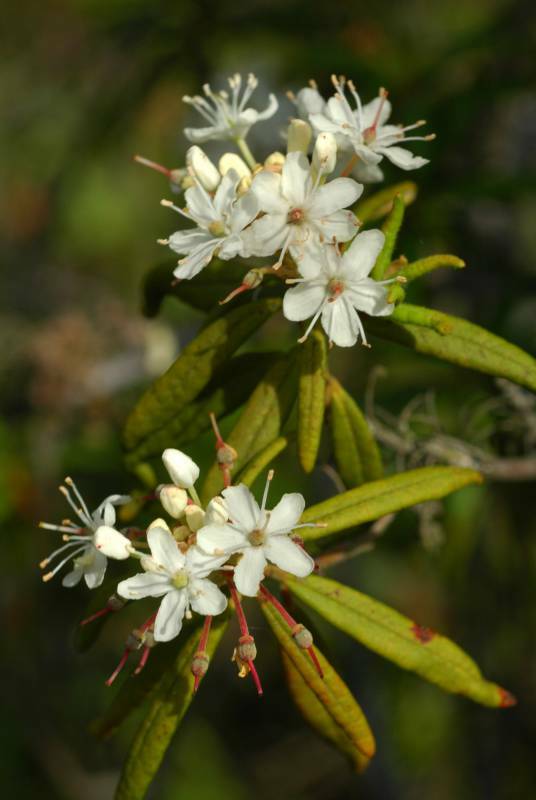 Notes: FNA8: "Rhododendron groenlandicum, R. columbianum, and R. tomentosum customarily have been placed in the genus Ledum. Ledum is here considered to be a subsection of Rhododendron subg. Rhododendron (as subsect. Ledum), a placement supported by the presence in these species of comparable complex, multicellular, glandular, peltate scales and phylogenetic analyses of morphological and molecular data. The glandular scales of species of subsect. Ledum lack the radiating, broad-rimmed fringe-cells found in some members of subg. Rhododendron (and characteristic of R. minus and R. lapponicum) but are essentially identical to those of species of subsect. Edgeworthia, e.g., R. pendulum (see K. A. Kron and W. S. Judd 1990). More than 500 species of subg. Rhododendron occur in tropical and temperate eastern Asia (J. Cullen 1980; D. F. Chamberlain et al. 1996)."